The Gospel of St. John gives us a Jesus, who steps with death, declaring an all-out war on death. "Those who believe in me, even though they die, will live," he promises, "dissing" the power of death. "Take away the stone," he orders the people, knowing full well that the dead body will be rotting, producing an awful stench. "Did I not tell you that if you believed, you would see the glory of God?" The challenge has been issued, and there is no backing down now. Only one power can emerge victorious: Jesus or death. Either Lazarus comes to life and Jesus is the champion, or the dead man continues to rot, death wins the day and Jesus looks like a fool. It is a battle to the finish. When Jesus steps with death, someone or something has to die. Jesus looks upward, speaks to his heavenly Father, and then cries with a loud voice: "What's up, any suggestions?" (No, that's not right.) 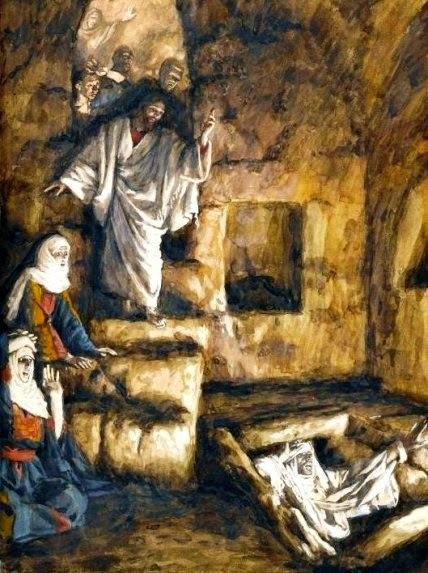 Jesus says, "Lazarus, come out!" The dead man comes out, his hands and feet bound with strips of cloth, and his face wrapped in a cloth. It is the death of death. Jesus says to the people around him, "Unbind him, and let him go." This victory over death gives us a hint of Christ's destiny, and steers us to the time a stone will be rolled away from a tomb on Easter morning.